"Our reserves will begin to melt before our eyes unless we get the next tranche." 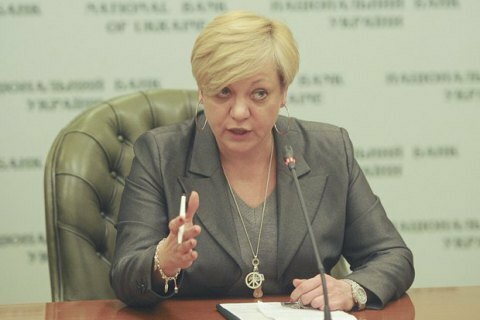 The governor of the National Bank of Ukraine Valeriya Hontareva said that Ukraine may not receive the fourth tranche of the International Monetary Fund this year. "Our baseline scenario envisages that we get $ 1.3bn this year but risks are that we do not get this year," Hontareva said in a Reuters interview. According to the central bank head, the delay with the Verkhovna Rada's adoption of a balanced budget, reforming the pension system and land reform may hinder a positive decision on behalf of the IMF. "If we do not get the next tranche and 700m dollars in the EU macro-financial assistance, the reserves that we have at 15.5bn dollars are just enough to cover 3.7 months of imports," said Hontareva. This would put the forecast increase of reserves to 23.1bn dollars next year and currency liberalization in jeopardy. Hontareva urged not to have illusions that Ukraine can do without international assistance. "If we do not get the next tranche, our will reserves begin to melt before our eyes, and what we have been doing over the past 2.5 years, when we stabilized the situation, raised our reserves, ensure macroeconomic stability, would evaporate into the thin air," she warned. "The Ukrainian economy is very small and open, it is highly dependent on exports and commodities markets, so I would like there would be no doubts that for the sake of financial stability we need to continue cooperation with the IMF and other donors," Hontareva said. Ukraine in September resumed cooperation with the IMF on the four-year 17.5bn dollar Extended Fund Facility (EFF). The Board of Directors of the Fund on September 14 announced the completion of the second review of cooperation program with Ukraine, and decided to allocate to Kyiv the third tranche of 1bn dollars. Ukraine received two previous tranches in 2015. Ukraine expects another revision of the reform program before the end of the year and the allocation of the fourth tranche worth $ 1.3bn in December.